For well under half the price of glass the Dynamic Growing Tunnel provides a return of fresh vegetables all year round with yields 80%  90% higher than outdoor cultivation. Safer than glass,the tough and durable Agphane that covers the tunnel contains UV sun ray inhibitors. Agphane absorbs the maximum heat from the sun during the day, providing a higher temperature during the night, 4°C more than other polythene products. 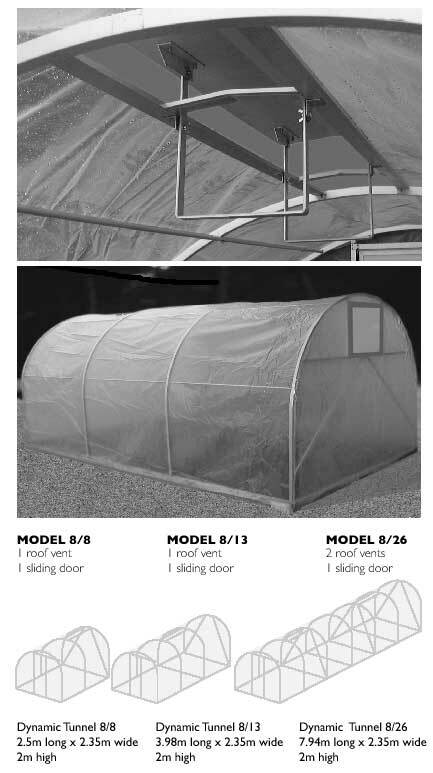 A revolution in home and market gardening, the Dynamic Growing Tunnel is the most efficient, economical and comfortable way of growing fresh flowers and vegetables, in all seasons, in all weathers. Foundation: Treated Pinus C3 Tanalised. Rails and pegs. (No extra foundation required ). Framing: Anodised aluminium. Maintenance free. Replacement covers and extra vents available on request.